A good scrapbooking album is a necessity for those who take their scrapbooks seriously. From handmade to store bought, learn what options are available to you so you can get the best one for your needs. If you really like the handmade aspect of scrapbooking, you might like the idea of simply making your own albums. If you make your own the pages are exactly the right size and exactly the number that you need, so there isn't any waste. You can use acid free paper in whatever color you want, so the background paper always matches your designs and you know that it's not going to degrade for a long time to come. Perhaps the best argument for making your own albums, though, is that the covers and bindings can be completely personalized. There is some variation between the different kinds of albums available on the market today, but you can make each one of your handmade albums a truly unique work of art instead of using the same album cover for your wedding album and your child's birthday book. The most basic type of scrapbooking album available on the market is the three-ring album. Much like the three-ring binders you carried to school when you were in school, these albums involve three center rings on which the pages are stored. This makes your pages really easy to take in and out and rearrange, but it also means you have to leave enough margin on the side of your layouts so that you can punch holes in the pages and slide them into your binder. These scrapbooks are limited in size to the number of pages that can easily fit on the rings. They tend to be inexpensive and basic in their design. You can buy archival sheet protectors and use acid-free paper to make sure that your memories will stay preserved. These books are very easy to use, particularly for a beginning scrapbooker who might not want to spend a lot of money to get a fancier book. But you do have to look at those ugly rings the whole time, and, as you might remember from your school days, the pages in three-ring binders do not always lie flat. We R Memory Keepers Classic Leather: These classic, leather-bound albums retail for under $30 and come in a wide range of different colors. They have a padded, reinforced cover with faux-leather covering. American Crafts 12-Inch by 12-Inch D-Ring Modern scrapbooking Album: This contemporary style album has a customizable chipboard cover with a two-tone edge. It retails for under $16. 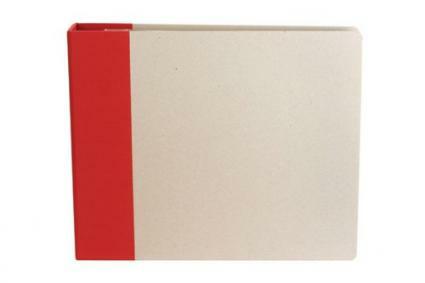 Pioneer 12x12-inch Apple Red 3-Ring Memory Book Binder: This classic, fabric-bound album costs under $20. It features D-rings for easy page turning and includes 20 refill pages. Probably the most popular type of album is the post-bound album. These albums often take the same refills as three-ring albums because they still have the holes in them, you just can't see the mechanism that holds the pages together as well. The posts are small metal posts that attach to each side of the cover. The posts screw together, holding the pages together and the cover on. When you open the book the pages open relatively flat and you can't see the posts. If you want to add more pages to an album of this sort, you can just make the posts longer and add more pages. These albums are a little harder to adjust or take pages in and out of, but they look really sharp and professional. These scrapbooks are very popular, so there tend to be more varieties of them available. 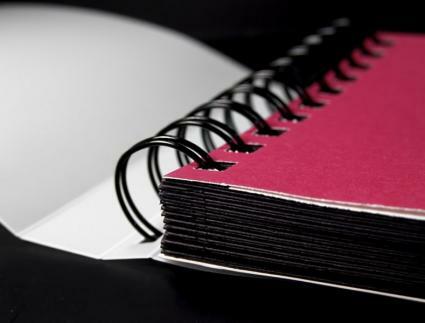 Instead of just plain solid colors in leather like you often find in the three-ring category, post-bound scrapbooking albums can be purchased in many different colors, patterns and materials. They are also more widely available in different shapes than the three-ring albums, allowing for more variety in your crafting. 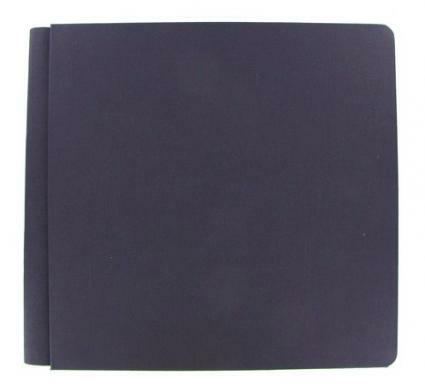 The Paper Studio: The Paper Studio makes a 12-inch, black cloth post-bound album that retails for under $20. It has 20 top-loading pages and an expandable spine so it can grow with your project. Colorbok: The Colorbok Fabric 12-inch post-bound albums are expandable albums that come in a wide range of different colors. They come with 10 top-loading pages and retail for under $12. The third main category of commercially available album is the strap-hinge album, which uses a leather strap to secure the pages in the book. They are expandable as long as the strap will allow, but you have to take the whole album apart to move pages. These albums allow pages to lie flat and the hinge does not show when the album is open. They are about middle-of-the-road in terms of price, though they may be a little harder to find simply because they aren't as popular. The Paper Studio: The Paper Studio makes a solid-colored 12-inch strap-hinge album for under $25. It comes with 10 top-loading pages and has an expandable spine to allow it grow. Hobby Lobby: This strap-hinge album features snap-load pages for easy refills. It measures 12-inches, has expandable pages, a cloth exterior and can be purchased for under $15. Another option is a spiral bound scrapbooking album. These are notebooks made out of acid free paper and bound with a large spiral like regular spiral notebooks. These scrapbooks are really inexpensive, but they can be fun because you can decorate the cover however you like since they usually come plain. They wouldn't be right for your wedding pictures, but they're fine for kid's stuff, especially if you want to make a part scrapbook part journal where your child can draw and write on the pages as well. 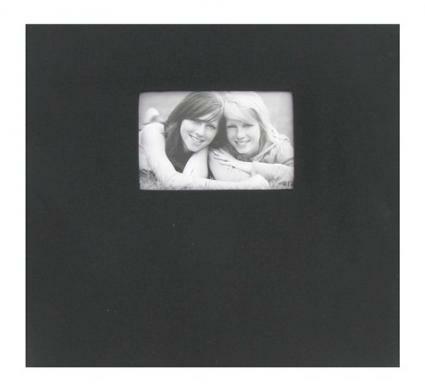 Darice: This simple, spiral-bound album features a white cover you can customize. It measures 12-inches by 12inches and retails for under $10. Sunrise Sunset Mixed Media Art Journal: The Scrapbooking Warehouse sells a small, spiral-bound album that measures just 7-1/2-inches by 9-1/2-inches. It retails for less than $15. Ultimately, the design of the album you choose comes down to personal preference. There isn't anything right or wrong about using any one of the types listed above. It is important, however, that you make sure that the album you are buying is of archival quality. It should be made with acid-free paper that's also lignin free, which ensures that it will last without yellowing. Stay away from albums that involve adhesives, like those old "magnetic" photo albums. They usually aren't of archival quality and if you ever want to take the pictures out you will find that they've gotten all sticky and are nearly impossible to clean without messing up the picture itself. With the right album, you'll find that your scrapbooking can take on new life. Try out a few different types of albums before you settle to make sure you get just the right one.